Iceland. Photo by NASA, Visible Earth. Pytheas of Massalia was a Greek merchant, geographer and explorer who explored Britain and the waters north of Scotland. He described an island six days sailing north of Britain called “Thule.” This may refer to Iceland, but could also have been the coast of Norway, or the Shetland or Faroe Islands. Pytheas was the first person to record a description of the midnight sun, the aurora, and Polar ice. 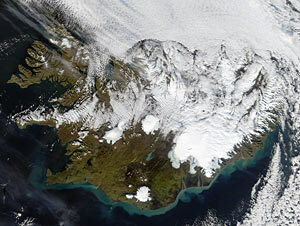 Floki Vilgerdarson, a Norwegian Viking, discovers Iceland. On his ship he carried three ravens and whenever he thought he was near land he released the ravens one by one so that they could show him the right way. The ravens always came back to the ship but one day the third raven flew forwards. Floki followed that raven and found the new land. 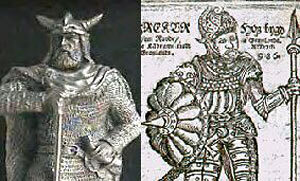 Erik Thorvaldsson, known as “Erik the Red” because of his red hair and temperament, discovers and settles in Greenland. A Norwegian, he grew up in Iceland. After a fight in which he killed two men, he was exiled from Iceland, so he set off to explore to the west and discovered Greenland and settled there for the rest of his life.